Kyushu has long flourished as the gateway to Japan because of its geographic proximity to Asian countries. It is said that Kyushu has an open culture because of its historical background, receiving new things from, and sending out its own culture to, foreign countries. The tour had nine participants from nine organizations (newspapers and news agencies etc.) of Korea, Taiwan, Singapore, Germany, Switzerland, Spain, Kuwait and Brazil. Second, the participants covered tmsuk Co., Ltd., a local robot manufacturer which is attracting world attention. The company has produced more than 30 kinds of service robots only with 20 employees. 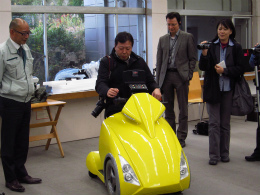 Mr. Yasutoshi Kume, COO and executive director, talked about their passionate motivation, saying “we want to create new industry of robots in Japan.” Then the reporters had a chance to see a demonstration of various robots such as for the nursing and rescue field. Third, the tour met the Mayor of Fukuoka City, Mr. Soichiro Takashima. He explained about the virtual “Kawaii-ku (cute ward)” which the city established as part of its publicity as the 8th ward. He showed the attractions of the city with the keyword, “kawaii.” Then the members of a local “idol group,” QUNQUN, based in Fukuoka, which had joined the city’s PR event in Singapore with the mayor, appeared. They performed the song and talked about attractive points of the city. 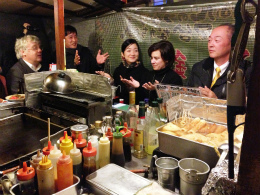 As the last visit in Fukuoka City, the tour went to the yatai (food stall) “Nakachan.” The participants visited the place to cover “yatai ordinance” which the city was planning to regularize the yatai business, and at the same time enjoyed Fukuoka’s specialties such as tonkotsu (pork) ramen and the friendly atmosphere of a yatai. First in Arita Town, the tour had a briefing by Ms. Yoko Ozaki, director of the History and Folklore Museum of Arita about the four-hundred-year history of Arita-yaki. 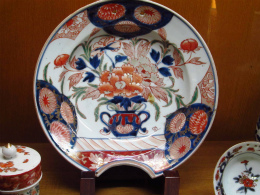 Ms. Ozaki described the origin of Arita-yaki porcelain started by Ri Sam-Pei, one of the craftsman brought from Korea by Hideyoshi Toyotomi’s troops, the great strides in the 17th century when they exported quantities of porcelain to Europe, and the present difficult situation of the industry after the bursting of the bubble economy. After that she guided the participants to the Gen-emon Kiln’s pottery museum, and showed them the gorgeous 17th century porcelain of the kind exported from Arita to Europe. 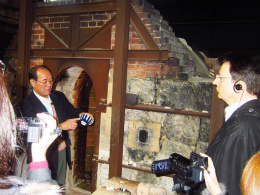 Second, the participants visited the studio of the Gen-emon Kiln, one of the oldest kilns in Arita Town. 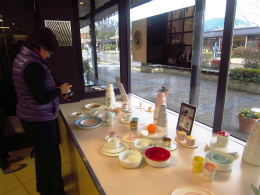 They had a chance to see the close-up of the production process of Arita-yaki porcelain, carefully made by hand. They were taking photos and videos with great interest. Third, the tour had an interview with Mr. Keizo Ishikawa, President of Saga Cardboard Firm, who produced the world’s first kaleidoscope made of porcelain to revive the local economy. 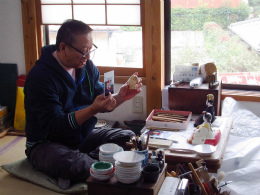 He had been collaborating with local kilns including the Gen-emon Kiln and had developed new luxury products of high quality to cultivate a new market. The participants showed interest in his approach. 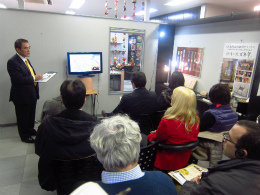 Finally, the tour covered Mr. Noriyuki Momota, President of Momota–Touen Corporation, who created the new brand “Arita 1616” targeting the world market, through the designer Mr. Teruhiro Yanagihara. His approach is to popularize Arita-yaki on the world market with products of simple design and reasonable price at first. The participants were interested also in his way of benefitting the local industry, and raised many questions.